Rejoice all ye bloodthirsty Mac gamers! Dennaton Games' ultraviolent indie hit Hotline Miami is now available for OS X.
I have a confession to make: I'm a Mac. The one flaw with being both a games journalist and an Apple devotee is that videogame offerings on OS X generally lag far behind what you'd find on Windows PCs. The situation has improved massively in recent years thanks largely to Valve Software's efforts to port the Steam digital distribution platform and almost all of its games to the Mac, but I won't deny that my hyper-expensive computer just doesn't offer the same selection of games that you might find on a machine running a Microsoft-branded operating system. To wit: When Dennaton Games released Hotline Miami last year, I spent weeks hearing from my colleagues about how awesome the game was. Not only was it an homage to classic gaming and a horrifically brutal action title, it was also a clever satire of both of those things. That's right up my alley, and yet I couldn't play the thing unless I wanted to go to the trouble of setting up Bootcamp or braving the perils of a Virtual Machine. Happily, that all changed a few moments ago as Dennaton Games has finally completed its OS X port of Hotline Miami. If you take a quick trip to Steam and search for the title, you'll find that its previously Windows-exclusive label has been replaced by a pleasant icon indicating both Windows and Mac compatibility. What's more, Hotline Miami still features an exceedingly low price tag: For only $10 you can spend the next few weeks murdering anyone dumb enough to stand between you and your targets in gleefully bloody fashion. 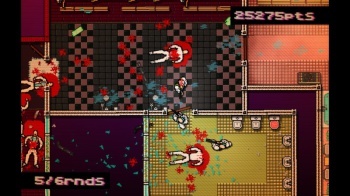 For those of you just stumbling in who have no idea what Hotline Miami is, the quick and dirty version is that it's a pseudo-adaptation of 2011's Drive, designed both as an arcade-style action game and a commentary on the horrific nature of the sorts of things we regularly do while engaging in our collective pastime of choice. Unlike most games that claim to contain important messages about the nature of gaming however, Hotline Miami doesn't beat players over the head with its message, nor is it insufferably pretentious. It's quite obvious from the moment you fire up Hotline Miami that entertaining players is its key goal. More directly, it's a game that casts you as something of a brutal assassin. You're given targets, then can choose how best to take them out. The game is designed in such a way that murder is neither easy nor clean, and having completed a stage you're likely to look back and see a sea of blood and an ocean of corpses. Also maybe a fjord of eyeballs, depending on which weapons you employ in your grim task. That's enough from me though. If you've got a Mac (or even if you're on Windows and have yet to buy Hotline Miami) you should rush to Steam this instant and download the game. It's absolutely worth the $10 price of entry, and I'd expect you to thank me for the suggestion, except you'll be too busy enjoying the gory mayhem to do anything else.